ever possible, mainly due to limited housing opportunities and no possibility to pay rents. Some people are not only bound to stay on an island in a camp but are also held in detention facilities. On Lesvos for example, new arrivals are regularly detained on short term during their registration procedure in a special compound within Moria camp. 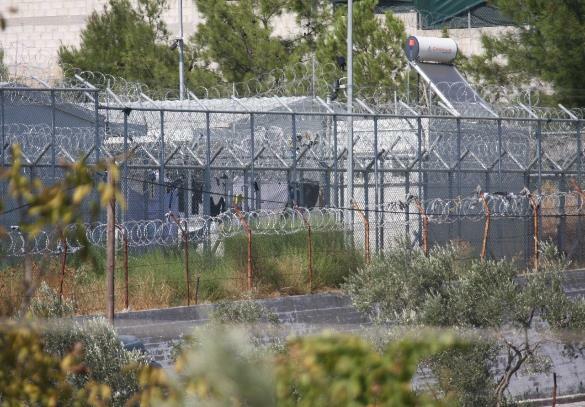 Furthermore, Moria camp also features a prison, a so-called ‘pre-removal centre’ that is situated within the walls of the camp. It is a heavily secured area that currently holds around 200 people, with an official capacity to detain up to 420 people [AIDA]. The detainees are migrants, all of them men, most of them who came to Europe seeking international protection. They are held in a pre-removal centre that is divided in different sections, separating people based on their grounds of detention and their nationalities/ethnicities. Most of the time, the detainees are locked in containers and only allowed to enter the prison yard once or twice a day for one hour. Moreover, former detainees reported about a solitary detention room, where people can be held for disobedient behaviour for up to two weeks, sometimes even without light. [Law 4375/2016, art.46]. This variety of legal grounds for detention open the possibility to keep large numbers of people seeking international protection in detention facilities. Lawyers report that it is extremely difficult to legally challenge detention orders, among other things because the reasoning for the detention orders are very vague. For asylum seekers, the duration of detention is generally limited to three months. However, it can be prolonged if e.g. criminal accusations are charged against them (that can for example arise after riots in the detention centre). The detention of migrants whose asylum application has been rejected or people who signed up for voluntary return can exceed three months. In some cases, people have to stay particularly long in detention and a state of limbo, when their asylum application and appeal is rejected but they cannot be deported because Turkey refuses to take them back. Lawyers can usually access the detention in the recommendation of the Asylum Service, however there is no individual reasoning for the detention. 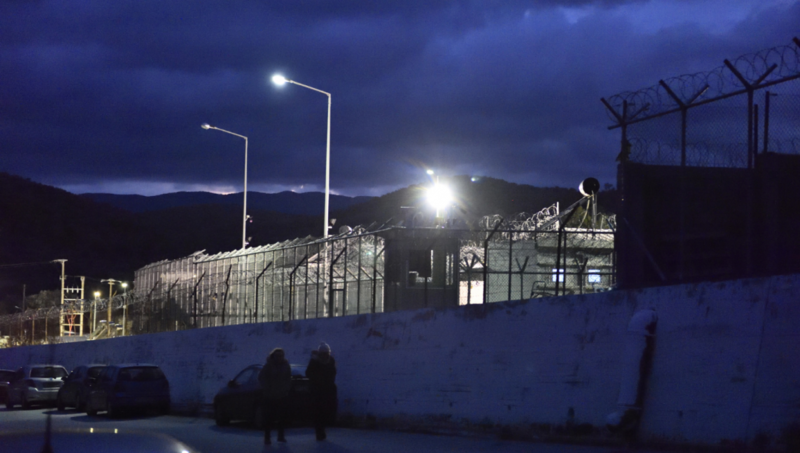 On Lesvos, apart from the involvement of a few individual lawyers, legal aid to challenge detention orders is almost non-existent which goes back to a lack of capacity and to systematic problems in the way courts address the “objections against detention”. for law-breaking conduct such as “thefts, threats-insults, body injuries [απειλές –εξύβρισεις], etc.”. Therefore, the classification of a person who committed minor offenses such as “trouble maker” and can thus be detained is left to police’s own discretion. Lawyers report that the paragraph is in practice often used to detain people who trespass the imposed geographic limitations. This arbitrary process strongly contradicts the Genève Convention’s notion to provide individuals with the rights of an impartial and individualized examination of their asylum claim. Moreover, it creates a self-fulfilling prophecy: Under the conditions of detention, asylum seekers have less access to legal counseling and are under strong pressure. In many cases they have only 1-2 days to prepare for their asylum interview and are unable to inform the lawyers about their upcoming asylum interview, because they are prioritized in the procedures. These factors are significantly lowering their chances to present their asylum claims well in the asylum interviews in order to be granted international protection status. While in detention, they are in many cases handcuffed during their registration and asylum interviews – thus stigmatising them as dangerous and suggesting potential danger to both the asylum seeker and the first reception/asylum service. An individual e.g. reported that being handcuffed while being questioned left him unable to speak a single word during his registration, where it would have been crucial to clearly express the will to claim asylum. 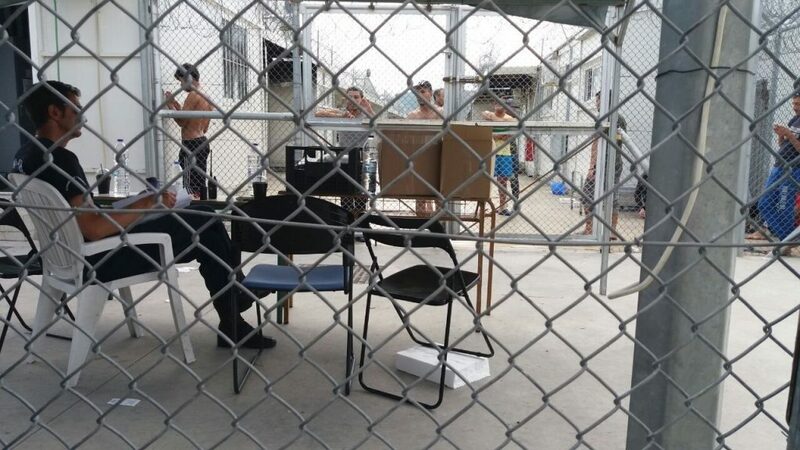 The rationality behind the detention of asylum seekers with low recognition rates seems to be aimed at rejecting and deporting them within the three months of detention – which so far has not even been achieved in most of the cases. Instead, this mostly leads to a mechanical procedure of unjustified detention. People from nationalities such as Algeria and Cameroon are detained directly on arrival and simply condemned to wait for their three months of detention to expire and to be set free afterwards. Once they are released, they find themselves in the overcrowded camp Moria, without any sleeping place or sleeping bag, and full of insecurity as to where to find orientation in an environment that treated them not as humans seeking protection but as criminals. release. Some people released from the pre-removal prison reported that they are survivors of torture and imprisonment – often the reason why they fled to Europe in the first place to seek safety only to find themselves again in prison. Medical examinations showed that some individuals detained in the pre-removal centre were minors. Although they had repeatedly expressed that they were under age, they were kept for many more weeks until the age assessment was finalized. Other people are held in detention, although they speak rare languages such as Krio, for which no translation is available and hence no asylum interview can be conducted. In the following, some accounts recently given by migrants about their detention in Moria’s pre-removal centre are illustrated in order to highlight the impact of the detention regime on individual fates. A young man from Cameroon was detained in the Moria pre-removal centre directly upon arrival under the so-called pilot project. He reported that he had tried to commit suicide on the night of the 7th to the 8th of September but was prevented from doing so by his friend. He had been detained since end of June 2018. He complained about insomnia and strong anxieties connected to experiences in the past, including the death of his brother and the fear that also his child and the child‘s mother might be dead. He postponed the date of his asylum interview four times, because he felt mentally unable to carry out the interview. A 22-year-old individual from Syria who arrived on Lesvos with serious back problems was detained in the Moria pre-removal centre after he had signed up for ‘voluntary return’. In Turkey he had had a surgery following an accident, leaving him with screws in his back. He decided to return to Turkey, because he found that the necessary surgery to remove the screws again could only be done there. On July 18 th , he reported having been severely beaten by a police official in the detention centre of Moria Camp. 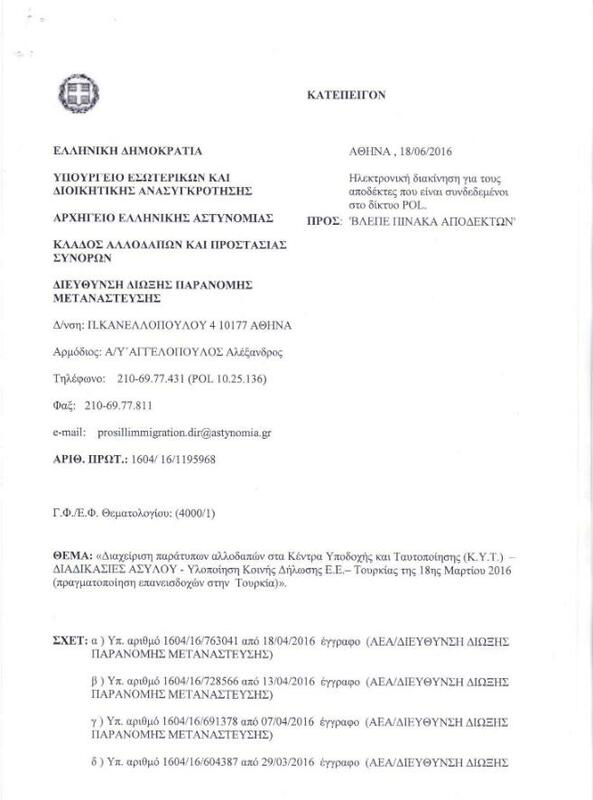 On the same day, independent volunteers handed in a complaint to the Greek ombuds-office. He was visited in detention by an ombudsperson on July 20 th and asked if he would hand in an official complaint but he refused fearing the consequences. Only four days later, on July 24 th, the man was deported. A man from Pakistan was detained on April 18 th on Kos Island after the rejection of the appeal against the first-instance rejection of his asylum claim. A few months later, he was transferred to the pre-removal centre in Moria camp on Lesvos Island. The authorities aimed to deport him to Turkey, but the country did not accept him back. The man reported that he was regularly throwing up blood and still sufferes from a heart attack he had had a year ago. According to his account, he was promised by the authorities to be brought to hospital on September 10th . However, he was instead transferred to the pre-removal centre Amygdaleza close to Athens on September 9 th where he is now awaiting his deportation to Pakistan.Another individual from Algeria remains in pre-removal detention, although he suffers from major psychological problems and is frequently strongly self-harming through severely cutting his body. Four young individuals who claim to be Afghan nationals but were classified as Pakistanis in the screening by FRONTEX were detained although they reported to be minors. One of them had been detained on the mainland in the pre-removal centre Alledopon Petrou Ralli and was transferred to the pre-removal centre on Lesvos Island after one month. He was then forced stay there for another few months, before finally being officially recognized as minor through an age assessment and released together with another individual who was also recognized to be under age. One of the individuals was considered an adult after the age assessment and the result for the fourth person is still pending. load of an application for annulment, he was finally unable to object the deportation and was deported only two weeks later, on August 16th. The extensive use of new legal possibilities to detain migrants has reached a new quality at the EU external border in the Aegean. The freedom of movement is gradually restricted. Thousands of people are forced to stay in the transit zone of Lesvos Island for long periods of time, and most of them have no other choice than to live in the European hotspot camp Moria. Others are even detained within the pre-removal detention centre located in the camp. There is increasing pressure from EU-level to impose detention measures. Also the Greek law, eventually based on the EU Reception Directive, provides enhanced possibilities to keep migrants in detention. In the practical implementation, they are extensively used predominantly for male migrants. More than to facilitate returns – that are comparatively low in numbers – the detention measures carry out a profound disciplinary function. They create strong insecurity and fear. Especially the practice of being detained immediately upon arrival sends the strong message to the affected person, as it is expressed in the police circular: You are an ‘unwanted alien’. This is a pre-decided stigma although the asylum procedure has not even started and the reasons as to why a person came to the island are unknown. Affected people reported that they feel treated like criminals. In many cases, they do not understand the procedural grounds for their detention and are therefore exposed to even stronger stress. Especially those people who have already been arbitrarily detained in their home countries and on the flight routes report about flashbacks and psychological problems arising from the conditions of detention that can lead to a re-traumatization. thousands of people – many of them who suffer from psychological illnesses such as traumatization – for months and years in highly precarious living conditions on an island where people slowly lose all hope to find a better future.